This is not breaking news but the Knicks STINK and they should just end this season right now. The Knicks went 1-3 over the last week and are now FOUR games out of the Playoffs. 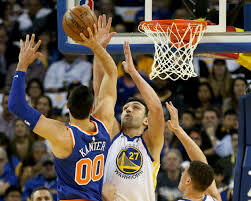 Their BEST player Kristaps Porzingis basically SKIPPED the game on Tuesday against the Golden State Warriors EVEN THOUGH he practiced on BOTH Monday and Tuesday. The Knicks are currently on a LONG West Coast ROAD Trip and are really STRUGGLING and still have TWO more games left so things are going to get WORST for the Knicks by the time they RETURN to Madison Square Garden LATER this week. The Knicks had a chance to WIN against the Grizzlies in Memphis but the Knicks do NOT like to WIN on the ROAD so they LOST. They had a SURPRISE win against the Jazz in Utah on Friday and that was their LONE win for them this week. They got BLOWN out by the Lakers in Los Angeles which was UNEXPECTED and also to the Warriors which was EXPECTED. They now FALL to 21-27 on the season, which is their WORST winning percentage of the season. This week the Knicks take on the Nuggets in Denver tonight, and close out the ROAD trip against the Suns in Phoenix tomorrow night. They will take on the Brooklyn Nets at HOME on Tuesday night to CLOSE OUT the week. They should win AT LEAST TWO games this week, if not their season is OFFICIALLY OVER, and I will DECLARE them DEAD. The Knicks issues start with Porzingis, who made his FIRST All Star Game in his YOUNG career this week. I am the BIGGEST supporter of Porzingis is the MAIN piece of the Knicks’ future, but his actions this season are NOT helping me SUPPORT him. He is on pace to miss FOURTEEN games this season and no “STAR” in the NBA misses that many games without a SERIOUS injury. The Knicks need to decide if Porzingis is going to be one of those players that will ALWAYS have injury issues and REEVALUATE their plans for the future. Frank Ntilikina Jr. made the Rising Stars All Star Game which is a BIG achievement for him in his ROOKIE season but he needs to get A LOT better on offense before being considered for the ACTUAL All Star Game. He is an ABOVE average defender but his LACK of offensive skills are going to HURT the Knicks if he is the Knicks point guard of the FUTURE. Another big CONCERN for the Knicks is Joakim Noah who has left the team for “PERSONAL REASONS”. Noah has NOT been GOOD this season so the Knicks will not MISS him, but players leaving the Knicks might become a PROBLEM. Last Year Derrick Rose left the team for a Week without informing the team where he was, we can all hope that is NOT the case with Noah. The Knicks are TERRIBLE right now and NO way near the Playoffs BUT they have some EASY games this week to POSSIBLY turn their SEASON around and start MOUNTING towards the Playoffs and REINSTALL some confidence for the Knicks hope of the Future. Yup. You hit it right on. Ntilikina is very raw, he’s a project. He could end up being a true point guard. But it’d be nice to at least see some kind of offense from him. He’s got nothing on the offensive end right now. And Porzingis just gets on my nerves every day with these soft injuries and excuses. There’s no reason he should’ve sat vs. Golden State. That’s a game he needs to play as a young, developing star.